Our rehearsal venue in Belgrave Road. 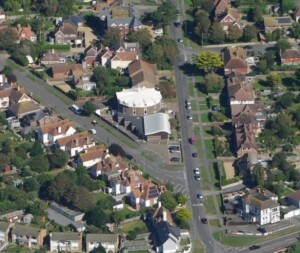 Rehearsals now take place in Seaford Baptist Church, Belgrave Road, Seaford. Rehearsals begin at 7.15pm, refreshment break at 8.15pm and we finish at 9.15pm. If any member without transport finds difficulties getting to the Church Hall, please speak to a member of the committee. There is a car park and street parking. Eastbourne to Brighton buses run very close by on the main A257, stopping at Claremont. Refreshments are provided during the break in rehearsals at 50p for a drink and a biscuit. Surplus from this enterprise is used to fund the end of term ‘hand in music’ party. Music is hired by the Society and loaned to members free of charge at the beginning of each season. Music scores will not be issued after 7.15pm at the first few rehearsals until the tea break, so please can members ensure they sign for their copies before commencement of rehearsals. Copies are returned at the end of term party on the Monday after a concert. A few copies of scores are available for members to purchase. The Society does have to pay for any missing music after a performance, so it is essential that all borrowed music is signed and accounted for, and returned promptly with jottings erased. Please do your best to learn your part before and in between rehearsals. This helps reduce the time spent on learning words and notes in rehearsals. Anna assists us with this by producing individual parts for practice which can be downloaded electronically. We also encourage you to listen to a recording of the music we are rehearsing. You may wish to use Cyberbass or Choraline to help with this.